The Shakh-I-Zinda Ensemble is one of the world-known necropolises of Central Asia, which includes mausoleums and other ritual buildings of 9-14th and 19th centuries. 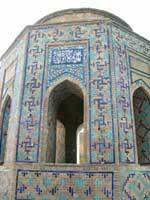 It is situated in the northeastern part of Samarkand. The name Shakh-I-Zinda - "The living king" is connected with the legend that Kusam ibn Abbas, the cousin of the prophet Muhammad was buried there. 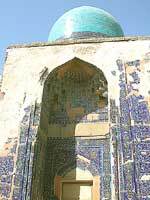 As if he came to Samarkand with the Arabian invasion in the 7th century to preach Islam. Popular legends speak that he was beheaded for his faith. But he took his head and went into the deep well (Garden of Paradise), where he's still living now. The Shakh-I-Zinda complex basically had been formed during nine (from 11th till 19th) centuries, and now it includes more than twenty buildings. The ensemble comprises three groups of structures: lower, middle and upper connected by four-arched domed passages locally called chartak. 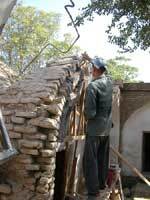 The earliest buildings date back to the 11-12th centuries. Mainly their bases and headstones have remained now. The most part dates back to the 14-15th centuries. Reconstructions of the 16-19th centuries were of no significance and did not change the general composition and appearance. The initial main body - Kusam-ibn-Abbas Complex is situated in the northeastern part of the ensemble. It consists of several buildings. The most ancient Kusam-ibn-Abbas Mausoleum and Mosque of 16th century are among them. In the picture: Upper Chartak of 14th c., southern wall of Kusam-ibn-Abbas Mausoleum and Minaret, 11th century. 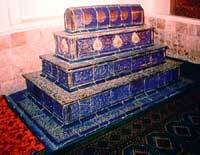 In the picture: The majolica tombstone from the Kusam-ibn-Abbas Mausoleum. The Mausoleum of 1361, on the right, restricts the same passage from the east. In the picture: The Mausoleum of 1361. The upper group of buildings consists of three mausoleums facing each other. 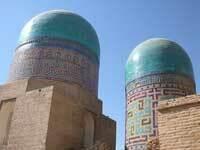 The earliest one is Khodja-Akhmad Mausoleum (40s of the 14th century), which completes the passage from the north. In the picture: Khodja-Akhmad Mausoleum. In the west of the ensemble, on the left, a group of buildings built in the beginning of the 15th century under Tamerlane's wife Tuman Aga's lead is situated. 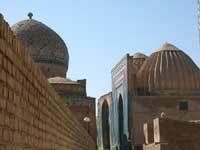 This group includes three edifices: Mausoleum, Mosque and Khujra. In the picture: The Mausoleum of 15 century. The middle group consists of the mausoleums of the last quarter of the 14th century - first half of the 15th century and is concerned with the names of Tamerlane's relatives, military and clergy aristocracy. On the western side (in a picture below - firs on the right) the Mausoleum of Shadi Mulk Aga, the niece of Tamerlane, stands out. This portal-domed one-premise crypt was built in 1372. Opposite is the Mausoleum of Shirin Bika Aga, Tamerlane's sister. In the picture: The Mausoleum of Shadi Mulk Aga and the cupola of Shirin-Bika-Aga Mausoleum - on the left. Next to Shirin-Bika-Aga Mausoleum is so-called "Octahedron", an unusual crypt of the first half of the 15th century. It was built as a rotunda with arched apertures. In the picture: The "Octahedron". Near the multi-step staircase the most well proportioned buildings of the lower group is situated. It is a double-cupola mausoleum of the beginning of the 15th century. In the picture: The double-cupola Mausoleum of lower group. 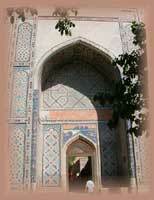 The imposing portal (Darvazakhana or the first chartak) turned southward was built in 1434-1435 under Ulugbek. 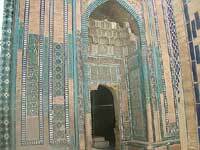 In the picture: The main portal of The Shakh-I-Zinda Ensemble. Actually Shakh-I-Zinda Ensemble represents architectural schools of Samarkand and Central Asia as a whole in their evolution. There was no end to the fantasy of ceramists in combining various types of decoration: carved and glazed terracotta, high relief and painted majolica, carved mosaic combined with murals against plaster as a background. Scientific researches of the complex began in the 19th century. Reconstruction is going on in present time. Hello, in fact English isn't our native language. Therefore we possibly have made many mistakes. If you found some, please excuse us. If you want to help, please fill contact form with description of mistakes and suggest how it's better to correct them. Your any assistance would be greatly appreciated. Thank you. 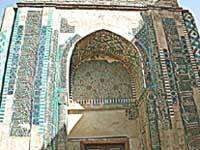 - Ruins of Kok Saray, former Palace Of Timur.